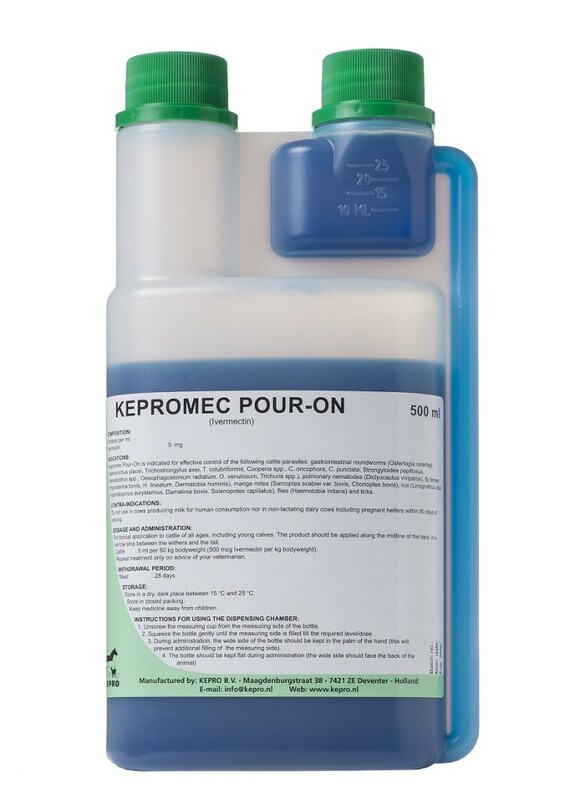 Kepromec Pour-On is indicated for effective control of the following cattle parasites: gastrointestinal roundworms (Ostertagia ostertagi, Haemonchus placei, Trichostrongylus axei, T. colubriformis, Cooperia spp., C. oncophora, C. punctata, Strongyloides papillosus, Nematodirus spp., Oesophagostomum radiatum, O. venulosum, Trichuris spp. ), pulmonary nematodes (Dictyocaulus viviparus), fly larvae (Hypoderma bovis, H. lineatum, Dermatobia hominis), mange mites (Sarcoptes scabiei var. bovis, Chorioptes bovis), lice (Linognathus vituli, Haematopinus eurysternus, Damalinia bovis, Solenopotes capillatus), flies (Haemotobia irritans) and ticks. Do not use in cows producing milk for human consumption nor in non-lactating dairy cows including pregnant heifers within 60 days of calving. For topical application to cattle of all ages, including young calves. The product should be applied along the midline of the back, in a narrow strip between the withers and the tail. 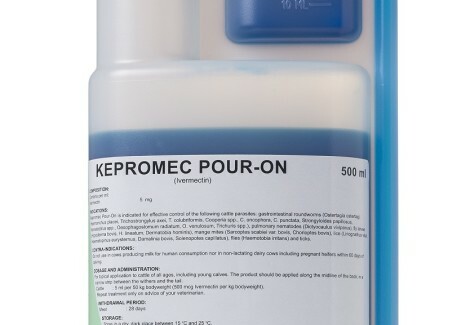 Cattle : 5 ml per 50 kg bodyweight (500 mcg Ivermectin per kg bodyweight). 1. Unscrew the measuring cup from the measuring side of the bottle. 3. During administration, the wide side of the bottle should be kept in the palm of the hand (this will prevent additional filling of the measuring side). 4. The bottle should be kept flat during administration (the wide side should face the back of the animal). 500 ml bottle with a 25 ml measuring cup (10 bottles per box).